Usually photo files obtained by digital cameras or scanners are very large in pixels. Images are also transmitted via the Internet, including photos, pre-reduced savings, so the need to increase their size occurs frequently. 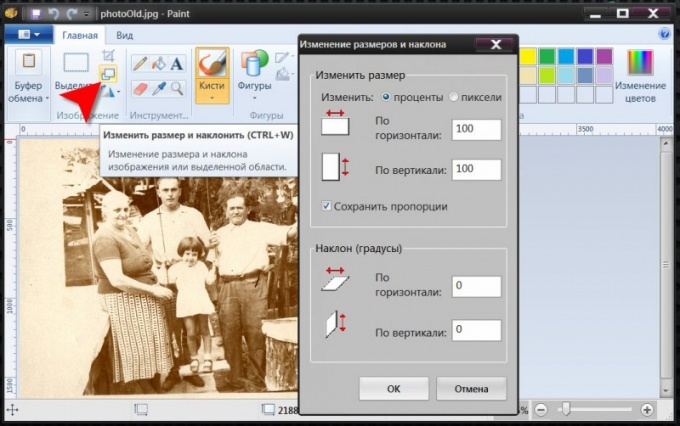 Take, for example, installed with the Windows operating system is a simple graphic editor Paint. To run it through main menu - press the Windows key to expand it, then navigate to "All programs", open the sub - "Standard" and select Paint. You can do without menus - press the win key and r, enter the text mspaint and click the OK button. Download to photoshop the photo you want to enlarge. The appropriate dialog can be accessed by pressing ctrl + o. With it find the computer file containing the photo, and click "Open". Specify the percentage of the Paint should increase the photo. This setting is invoked by clicking the middle button in the vertical group of three icons section of the "Picture" menu editor. The same command is duplicated hot keys ctrl + w. In the opened window, "resize and skew" the top section contains the settings you need zoom - increase to the desired value a number in the "horizontal" or "vertical". Default size is specified here in percent, and the change is proportional, but if necessary, you can change both settings - check the box labelled "pixels", and the checkbox "Keep aspect ratio" uncheck the box. When the zoom options are set, click the OK button and Paint will resize the pictures accordingly. Save the made changes. If the file containing the original image you no longer need, just press ctrl + s, and a graphics editor will record the photo in its new size in the same file. Otherwise, click the blue button in the upper left corner and in the popup menu, go to "Save as". Select one of the listed there graphic formats, and the application will open the standard Windows save dialog. In it you will need to specify the name of the new file and where it needs to be recorded, and then click the "Save" button. The augmentation and preservation of the photos to be completed.